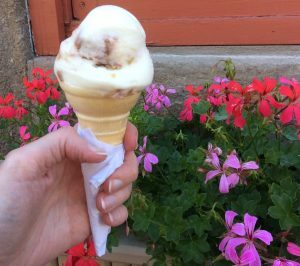 Jen Gilroy » Ice cream season is here! As you may know, I like ice cream. 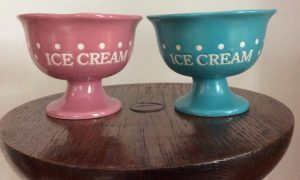 Although I’ve indulged even when wearing my parka, it’s summer when ice cream comes into its own as my treat of choice. Ice cream features in my two “summer” books. Strawberry Sensation has special memories for the hero and heroine in The Cottage at Firefly Lake, and a Canadian favourite, Tiger Tail (orange flavor with a black liquorice swirl) crossed the border to Vermont in the upcoming sequel, Summer on Firefly Lake (releasing July 25). Since I have a July birthday, ice cream has always been on the celebratory menu, and although it may not officially be summer until the June solstice, the season starts for me when my neighbourhood ice cream shops reopen after a long winter. For me, one of the best parts of travel is sampling local ice cream. From traditional gelato in Italy, to vintage Victoria Plum on England’s North Norfolk coast, and Chai Tea in Hong Kong’s steamy heat, my sugar fix is unashamedly global. Yet, some of my happiest ice cream memories are closer to home. Winnipeg’s Bridge Drive-In is where I had my first ever ice cream cone, and when I head back to that midwestern Canadian city where I grew up, it’s top of my list of places to visit. Even waiting in line (and in summer the lines can be very long indeed) is part of the experience. There’s also an ice cream shop in the small town where I live and, like the best ice cream stands, it’s a community focal point. Families have gathered there on summer evenings for several generations, and my family is now part of that tradition. Not least, there is homemade ice cream. Tech Guy and I received an ice cream maker for a wedding present (our friends and relatives know me well! ), and a happy memory from our early married life is the vanilla chocolate chunk ice cream he made as an anniversary surprise. The next time you read one of my books, the ice cream references aren’t accidental. In both my life and fiction, it wouldn’t be summer without ice cream. It’s my comfort food, inspiration and celebration all in one. Apart from having to work off all those calories, what’s not to love? As the days get warmer here in the northern hemisphere, I wish you happy times, good books and sweet treats of your own. 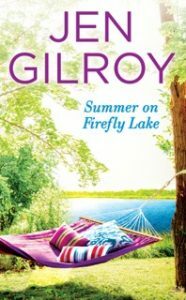 And if you’re looking for a summer read, I’d be remiss if I didn’t mention that Summer on Firefly Lake is available for pre-order at Amazon, Barnes & Noble, Chapters-Indigo and all other retailers! Ice cream and summer go together. Thanks for sharing your ice cream memories. I also have a takeout shop that I had a scoop of chocolate on a sugar cone last weekend when it opened. Dip cones at Dairy Queen were a favourite, growing up in Montreal.Another enjoyable, making me crave for ice cream, post. Thanks Jen! You’re welcome, Lynn. Thanks for reading. I also like DQ dip cones although they can be a bit messy! Enjoy your takeout shop this summer. My view is that if you eat your ice cream while walking it’s less calorific! How nice to share your ice cream memories. It’s funny, isn’t it, how different ice creams can be, which means we all have different favourite brands as well as falvours. The best ice cream I have ever come across is made in Conwy by a firm called Parisella’s. Fortunately for me, Conwy is just across the estuary from where we live, so Parisella’s is easy to get hold of. I will look out for ice cream references when I read Summer at Firefly Lake. I’ll also be on the look-out for characters with blonde hair, after your earlier blog about your old yearning for blonde tresses! Thanks for sharing your favourite ice cream with me, Sue. Wishing you happy ice cream eating! A perfect treat to celebrate the release of your first book, ‘The Deserter’s Daughter,’ don’t you think? Ah…the sweetness of a cold ice cream enjoyed during a blazing heat wave! We used to buy ice cream at the grocery store, but we have recently rediscovered our frozen yogurt maker. It’s not quite as creamy as ice cream, but still very tasty. It’s rare that there are any leftovers! Sounds yummy, Heidi. If it’s not too self-serving, may I say that I hope to sample your homemade frozen yogurt sometime soon? !